The formal name was the Abbey Church of St Bridget of Syon or locally known as Syon Abbey or just the Abby. The Brigittine community was first established by Henry V in 1415 at Isleworth, Middlesex. At the dissolution in 1539 the monastery was suppressed and took refuge in Flanders but after an absence of 300 years returned to England in 1859 and settled at Spettisbury, Dorset where they remained until moving to Chudleigh. 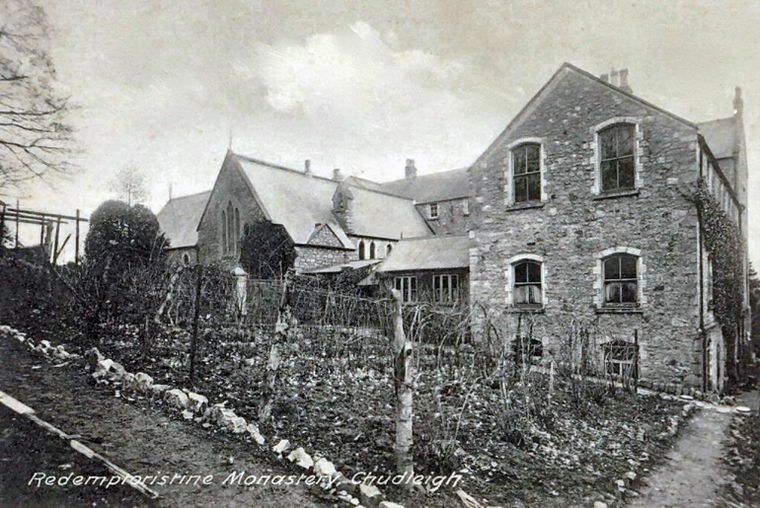 In 1887 their convent and chapel were built at Chudleigh on three acres of land given by the owner of Filleigh and designed as a closed community for more than forty people. 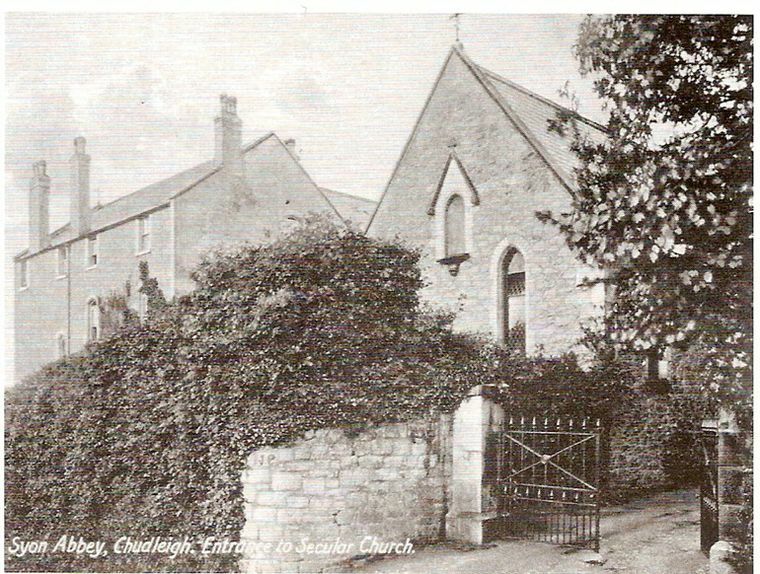 The secular chapel was formally opened on Sunday 9 December 1887 and was available to local Roman Catholics. The priest who lived in an adjacent house was never allowed to enter the convent. A small burial ground was located a short distance to the west of the main building. The 1891 census shows that there were sixteen resident nuns including the 65 year old abbess, Clara Heyes, originally of Burton-on-Trent. The resident priest was John Dickenson, aged 50, born at Monkton Combe, Somerset. In the 1923 directory she was styled as Dame Agnes Teresa Jocelyn, Lady Abbess. 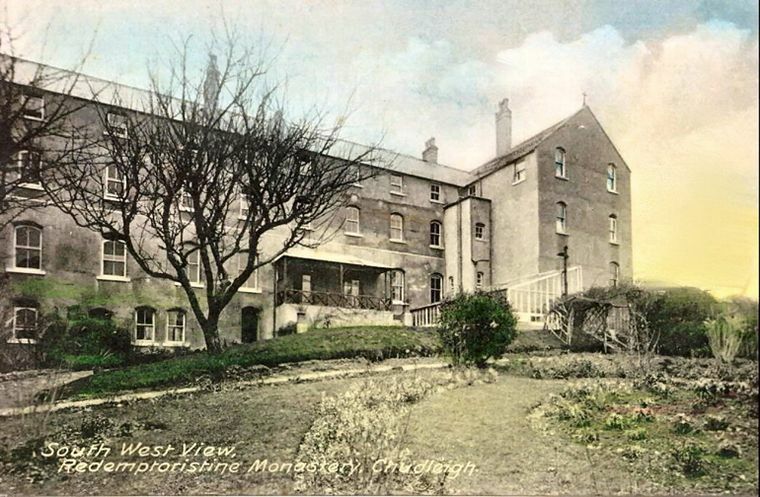 In 1925 the premises were sold and the nuns moved to Rattery where they acquired the neo-classical Marley House. It was renamed Syon Abbey and remains so called today. That house was originally owned by the Palk family and had passed to the Carew family of Haccombe in 1806. 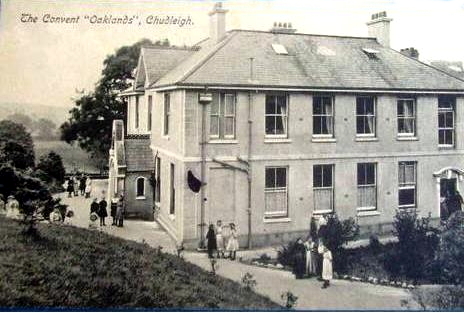 The Chudleigh buildings were then acquired by Redemptoristine nuns for their convent (or monastery) who had moved from Clapham, London, where they had been since 1897. It was reported that the move from London was due to the fact that Clapham was no longer the rural location it was when they moved there. The nuns were of a 250 year old order that had its origins in Italy. A closed contemplative order there were 28 nuns at the outset; in 1926 the abbess was E. Foulon. Their number had depleted to ten by 1989, all of whom were over sixty years of age. It was decided that the premises were too large and so it was put up for sale along with 13 acres of adjoining fields, the asking price was £500,000 for the freehold. On sale the nuns moved to a Catholic campus near Liverpool. One lady who missed her sister so much when she joined the convent built a house opposite called Abbeylands so she could be near. The Kelly's town directories list a Miss Tozer at that house in the period 1930–39. The property was duly purchased by a couple who converted one unit for their own use and the remainder was split into five large houses, each with a garden and at least one and a half acres of pasture. From 1873 the house was in the occupation of Major General Charles James Buchanan Riddell CB RA and his wife Elizabeth. She died at the house in 1900 and he in 1903. In August 1907 and for the next fifteen years the house was home to St Joseph's Ursuline Roman Catholic Convent. The Ursulines are a religious order founded at Brescia, Italy, by Saint Angela de Merici in November 1535, primarily for the education of girls and the care of the sick and needy. Their patron saint is Saint Ursula. The French nuns' former home, a monastery at Carhaix, Finistere was said to have been ten times larger than Oaklands and had accommodated 54 sisters and 400 scholars. This building still exists and was for many years a school. It is located in the centre of Carhaix on Boulevard de la Republique. The nuns had been expelled from their convent under the 1905 French law (Separation of the Churches and State) and had transported most of their belongings to Oaklands in August 1907. In September a group of 24 nuns joined those who had come over a little earlier. A further ten and the Rev Mother Hyacinthe were to arrive in early October. The town directory of 1910 gives the heads of the convent as Rev Mother Hyacinthe (Eugenie) Lamy and Rev Father Andre Rolland. The 1911 Census taken on 2 April that year gives an interesting insight into the convent and its occupants. A total of 48 rooms (excluding scullery, landings, lobbies, closets and bathrooms) were occupied on that day by 92 people. This number comprised forty-four French nuns, forty-one French female students and 3 English, 2 French female visitors, a French male errand boy of 17 years and the Rev Father Andre Rolland, described as the chaplain. Rev Mother Elisa M L (Antasis) Lamy died a few months after the census was taken aged 88 and the convent head was then Rev Father Andre Rolland. The next available town directory of 1914 confirmed Rev Father Andre Rolland as the head of the convent, a position he held until his death in 1916 aged 54 years. The next available town directory for 1919 shows the head of the convent to be Rev Mother Marie Raphael. 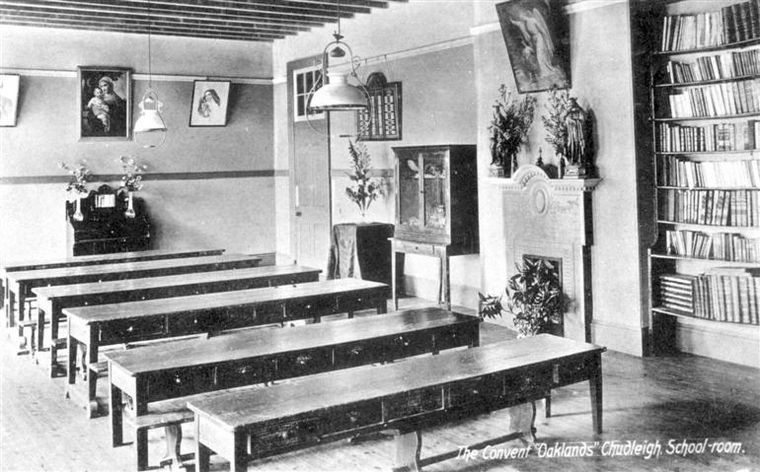 Pray for the repose of Revd A. Rolland and Ursulines whole died at Oaklands 1905–1922"
A sale advertisement in the local press stated that the auction of the house was to take place at the Globe Hotel, Newton Abbot on 10th January 1923. The detail given said that the house had, until recently and for many years past, been used as an Ursuline Convent and is eminently suitable for a school or similar institution, occupying a sheltered and healthy position. Containing 35 to 40 rooms with central heating, electric light and ample water supply. In the grounds a detached 10-room house also two cottages, fernery, lawn, kitchen gardens, flower gardens, shrubberies, plantations, orchards and pasture land. The whole extending to 26 acres 0 roods and 21 poles. Today the Ursulines run many schools and colleges, particularly in North America. Also in this country, mostly in the London area and a number are located in Eire. The majority remain all-female although some sixth-form colleges admit males. By 1926 the house was occupied by Mr Herman Joseph Cramer who had previously been at Kerswell House, Chudleigh. He renamed the house Westwoods and stayed until the death of his wife in 1932. The house, still called Westwoods continues as a private residence today.